LOCAL residents have joined forces with the town and parish councils to help move forward with plans for ‘Shurnhold Fields’ – a new mini country park on the site of the former George Ward School playing fields. The two councils are hopeful that interested residents will help form a new group – ‘Friends of Shurnhold Fields’ – that will help with the development of the area and ongoing maintenence. Residents were also invited to visit the site with councillors to explore the area and make more suggestions for the vision of ‘Shurnhold Fields’. 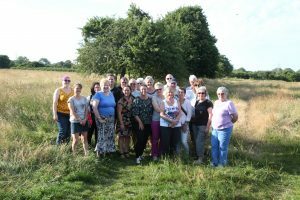 Melksham News joined the residents on the tour to capture their thoughts and ideas for the green space – many praised the idea as a haven for Melksham’s wildlife and a space for families to enjoy. However, some locals expressed concern about the history of flooding on the site, calling for a clear maintenence plan to be produced.